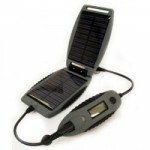 The Powermonkey-Explorer solar gadgets is a great addition to the gear of high energy individuals who are often on the move and cannot be without their phone or Ipod. Your away from home, you really need to make that call and your mobile phone has just run out of power. Or you on sitting on a amazing overlook in the Sierra’s or Rocky Mountains and your iPod has just played its final tune, or just about to take that trip defining picture, and your camera battery has died. The Powermonkey-eXplorer ensures that never again will this happen to you. Compact and powerful, the Powermonkey eXplorer is always ready for your next outing, and with the new solar slave, the Powermonkey-eXplorer lets you whenever you need it. For smaller devices, it will get the job done.